Such is life for Wilson, one of the most hated players in the NHL — if not the guy at the top of the list. 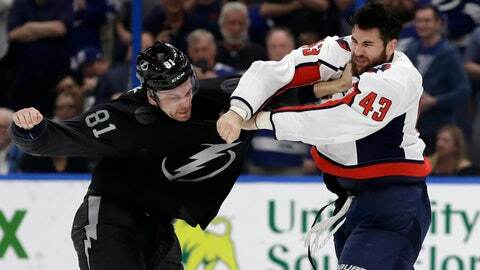 The Washington Capitals winger has been suspended four times over the past 19 months and there were a few other incidents that might have crossed the line. He is the guy opponents and their fans despise and the player no teammate would willingly do without. Inside the Capitals’ locker room, the 25-year-old Wilson is so admired he could succeed Alex Ovechkin as captain. Wilson turned Carl Hagelin from an enemy into a friend after five hard-fought playoff series against him. Hagelin watched Penguins‘ teammate Aston-Reese go down on a hit to the head from Wilson in the second round last spring, but after a trade to the Capitals, he has come to appreciate the human underneath the No. 43 jersey.